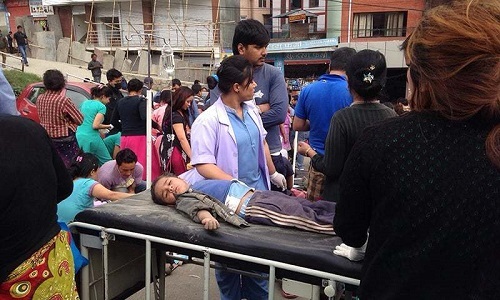 While the number of injured in Saturday’s devastating earthquakebeing airlifted to the District Hospital in Dhading from far-flung areas in the district continues to rise,patients admitted to the 15-bed hospital have been left high and dry due to a lack of food. Except for the 15 injured who were admitted initially, the hospital management has stopped providing food to other patients altogether citing a lack of resources. Moreover, many patients do not have any caretakers and have also been deprived of drinking water. Although patients at the hospital have been receiving basic treatment, the District Disaster Management Committee’s (DDMC) focus on rescue alone has become a major factor impeding food supplies. Meanwhile, landslides in Jharlang and Richek VDC’s in the district have severely disrupted transportation, adding to the difficulties of the people in the district. Reports coming in say a dozen or so doctors, including six from the Capital along with 60 health volunteers have been working day and night at the hospital. Meanwhile, rescue choppers belonging to the Indian Army have returned after facing trouble in landing at the affected areas, including Khalte, Sertung and others except district headquarters, Aarughat and Darkha, leading to the increase in loss of life. Even as eight excavators have been deployed to open affected roadways, except for Sunaula bazaar and Salyantar, transport services have not been resumed, affecting those trying to connect with their relatives in the affected areas. The IA choppers have, however, been able to drop some food provisions, including a few sacks of rice, noodles along with 900 tents flown to the worst quake affected areas, including district headquarters, Phoolkharka and nine other VDCs.